Zones: 4 - 8, foliage may remain evergreen in warmer climates. Full sun to part shade. A perennial for the millennial! 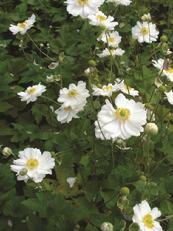 Easy to grow, loved by bees and butterflies and deer and rabbit resistant too! Rose-purple rounded flower clusters bloom in late July-August above narrow glossy green leaves. The slightly aromatic clump-forming foliage grows 12-15” tall and wide. 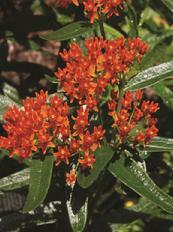 As a magnet for butterflies, Butterfly weed works well in mixed borders, meadows and naturalized areas. It has orange flower clusters June through August, which are followed by green seed pods. Grows 1-2’ and tends to emerge late in the spring. Prefers average dry to medium wet, well-drained soils. Satiny white single nodding flowers with yellow centers appear on 3' stems with the first hint of cooler September-October weather above dark green deeply divided leaves. 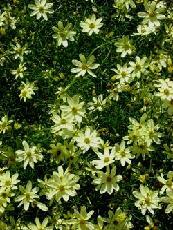 They prefer moist well- drained soil and will spread rapidly. 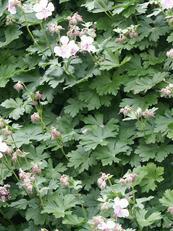 This Geranium, also known as Crane’s Bill, is the perfect groundcover for any garden. Delicate, pure-white blooms are splashed with pink, creating an elegant carpet of color in the summer garden. Biokovo grows in full sun to light shade and tolerates most soil types. Geranium Biokovo attracts pollinators to the garden and will quickly become one of your favorite go-to perennials for easy-care, low-growing blooms. This variety spreads heavily, but it is easy to control by digging up and dividing every few years. It’s the long, graceful arching 3' stems of alternate leaves with their white edges that attract shade gardeners to this woodland plant. 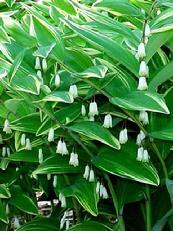 But a bonus is the clusters of white tubular flowers that dangle under the leaves in May and June. Give the plant reliable moisture in rich soil and it will reward you for years. Plant 15” apart. Jack Frost nipping in May? 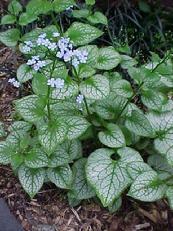 Cool blue forget-me-not flowers dance above the silvery-white and green variegated heart-shaped leaves in April and May. 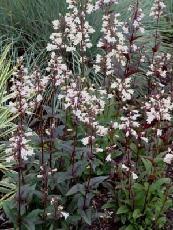 The 15” tall foliage maintains its unique variegation without reversion and will enjoy the company of Heuchera ‘Citronelle’ or Hosta ‘August Moon’. PP#13859 Plant 18” apart. 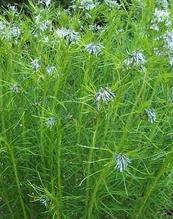 Powdery blue star-like flowers appear early summer atop 2-3’ stems. Later in the fall the thread like foliage turns to a golden yellow. Amsonia hubrichtii adds a wonderful texture to the border and airiness to a bouquet. Consider cutting back the stems after flowering to help keep it in a neat mound. 2010 Perennial Plant of the Year - Baptisia australis. This showy native species has been popular with gardeners for many years because it is easy to grow and offers four seasons of interest in the landscape. In mid to late spring, foot long spires of intense indigo blue flowers rise above the foliage, commanding attention in the spring landscape. After the flowers have faded, the trifoliate, soft blue-green foliage takes center stage, forming a sturdy, upright, shrub-like clump to 3-4 feet tall and wide at maturity. It makes a terrificbackdrop for other perennials and groundcovers growing at its feet. Baptisia australis is very easy to grow and requires little maintenance if sited properly. It grows best in full sun, but will tolerate light shade. 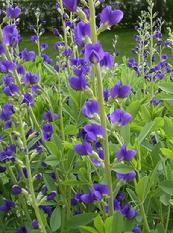 Once established, Baptisia is drought tolerant due to its tough, deep tap root. No serious pests or diseases are known to afflict this plant. 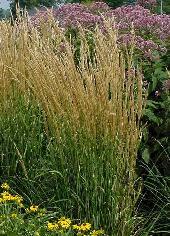 2009 Perennial Plant Of The Year - Hakonechloa macra �Aureola�. Featuring a graceful, flowing form and golden foliage of this ornamental grass. The color can vary depending on where the grass is planted. 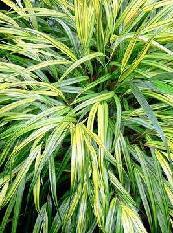 In partial shade, the foliage will appear almost all-yellow, with narrow green stripes near the margins. In full sun, the foliage can bleach to a parchment yellow, and in full shade, it becomes chartreuse. 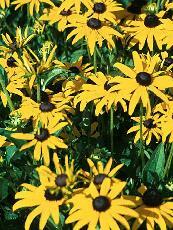 �Aureola� will maintain its graceful, cascading habit throughout the season. In late summer, seed panicles will appear above the foliage. When the weather gets cooler, the foliage turns a reddish-pink hue. �Aureola� can grow up to two feet tall. Zones 5-9, and has been known to overwinter as low as Zone 4. The best, most garden-worthy hardy Geranium you can grow. Large 2�" saucer-shaped flowers just never quit. Violet-blue blooms with white centers flower profusely from late spring through November, or until frost. 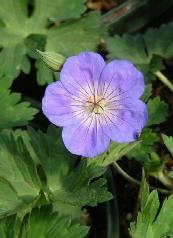 Unlike many Geraniums, 'Rozanne' has great heat tolerance, too! Vigorous, but never invasive. 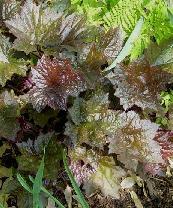 Mounded, slightly marbled, deep green foliage becomes reddish brown in fall for added interest. Place in front of beds or borders. A good groundcover with nice habit for patio planters, window boxes and hanging baskets. Prefers average well-drained soils. Moist organic soils will promote spread. Tolerates summer heat better when given ample moisture and partial shade. Plants can be sheared to 3" to rejuvenate. Rarely needs division. 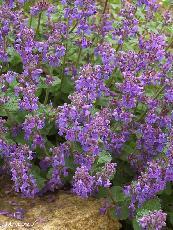 Introduced in 1988 in Europe, Walker�s Low catmint has become increasingly popular due to its lovely blue-violet flowers, it's long bloom time, attractive grey-green foliage, ease of propagation, lack of pest or disease problems and low maintenance needs. A good companion plant for early and late blooming plants. Great for perennial borders, herb gardens, rock gardens, or as a container plant. 30 to 36 in. tall/wide. Blooms continuously throughout the season if pruned. Leaves have a wonderful aroma when crushed. Deer & rabbit resistant. 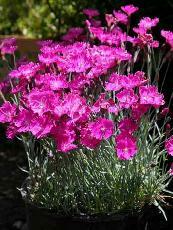 When a number of customers touted this Dianthus throughout the growing season, we decided to see for ourselves, and here�s the scoop: magenta single-petal blooms at 8�10" will fill your garden in May and June with their lovely fragrance. This long-bloomer has blue-green foliage, needs excellent drainage, and prefers alkaline soil. See what you think. Known as one of the earliest flowering perennials in our area, the Lenten Rose�s blooms appear on 18" stems in very early spring (March) and persist for up to 8 weeks. The large flowers range from cream to plum with a hint of green. Given rich, well-drained soil and shade, it will self-sow, creating a colony of plants with handsome evergreen leaves. This shade garden classic also continues to gain popularity for its evident success in dry shade conditions. 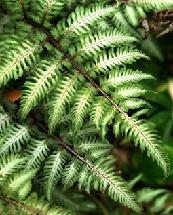 Often considered the most decorative of ferns, this deciduous 18" Oriental beauty blends gray-green fronds with wine-red stems. 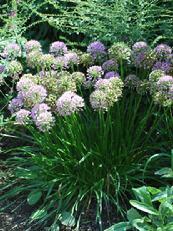 It is slow-spreading and thrives in shade or partial shade where soil is moist but well-drained. Its tri-color fronds emerge in the spring making it a perfect companion for early bulbs. 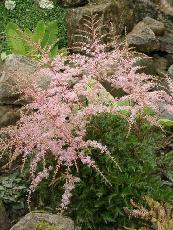 Try it with Astilbe c. �Pumila� and Hosta s. �Elegans� for a long season of texture contrasts. A very hardy fern which complements a host of perennials. See color photo on the back cover of catalog. Hardy in USDA zones 4 to 9 (hardiness range for all unless otherwise noted) and requiring full sun (minimum of six hours of direct sunlight). Provide a soil rich in organic matter (so it retains adequate moisture rather than allowing it to leach right past the roots), yet one that is well drained (so the soil isn�t constantly wet). Test your soil pH to ensure that it hovers between 6.5 and 6.8 (the preferred range for all the perennials unless otherwise noted). 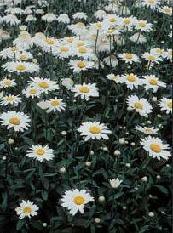 �Becky� reaches 24 inches in width, with large 3- to 4-inch daisy blooms. Cut flower stalks to the ground after bloom, so basal foliage can rejuvenate for the fall garden. Divide every few years in early autumn. Cut all perennials back to ground level in the fall, unless otherwise noted. 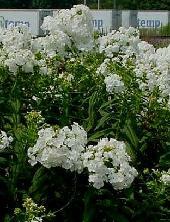 A pure white, mildew-resistant, tall garden phlox that reaches upward of 40 inches with a width of 24 inches. 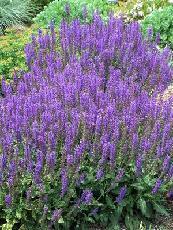 Another perennial that enjoys an organically rich soil with excellent drainage and full sun. Blooms late July through August, sporting large, very fragrant, 6- to 8-inch wide panicles (round flower heads composed of clusters of smaller individual flowers). 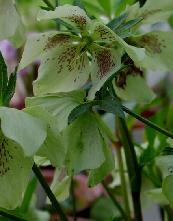 Excellent as a cut flower, especially if picked when the head is only about half in bloom. Divide every two to three years in early spring, once shoots emerge. Locate in full to partial sun (four to six hours of direct sun) with a well-drained, organically rich soil. 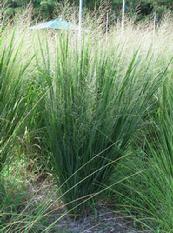 This grass is non-invasive, growing 48 inches tall and only 15 inches wide. The flower is a feathery, light-pink inflorescence in June. Leave standing to provide winter interest; cut back in spring. Divide every five to six years, in early fall. Often described as the �perpetual motion grass�, due to its elegant movement in a slight breeze. 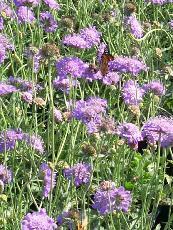 2000: Scabiosa columbaria �Butterfly Blue�. Hardy in zones 5 to 10. It prefers a well-drained, organically rich soil in full sun with a pH around 7.0 to 7.2. Deadhead (pinch off spent flowers) and it will bloom continually June through August. Roughly 8 inches in height with flower stalks extending to 12 inches; the wiry, bluish foliage offers its own interesting feature. Divide in early spring, but don�t cut back in autumn; simply prune out dead stalks come spring. Tolerates Drought very well. Prefers full to partial sun and a well-drained, organically rich soil. One of the best known and longest-blooming perennials (July through October), not to mention an outstanding cut flower, it�s often called black-eyed susan. Re-seeds rather prolifically, making it excellent for mass plantings. Reaches 20 to 30 inches in height and 18 to 24 inches in width; divide early spring, every four to five years. Blooms July through September. Drought-tolerant with a preference for full sun coupled with a well-drained soil. Excellent cut flower with its dark purple-pink, daisy-like blossoms and protruding center cone. Height of 36 inches with a spread of 24 inches; provides winter interest and will re-seed if not cut down in fall. Requires full sun. Prefers well-drained soil and will tolerate drought once established, but never soggy soil. 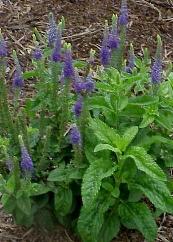 Tiny dark blue flowers line 10-inch vertical spikes from May to early June. Divide in early fall, once the crown begins to die out. Fragrant plant reaching 20 inches in both height and width. Will appreciate a location in either full or partial sun with well-drained soil. Beautiful red-bronze foliage topped with numerous 24-inch flower spikes lined with white, bell-shaped blooms in June. Divide in early fall when necessary. Excellent for bouquets. 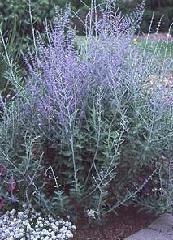 1995: Perovskia atriplicifolia or Russian sage. Provide full sun and a well-drained soil. Tiny, light-blue flowers cover its stems from July through August. A large plant, Stretching as a woody perennial; never cut back to ground level, simply prune in spring. Requires a moist, very organically rich soil in full sun to filtered shade with a 6.0 to 6.2 pH. Fertilize early spring with 10-10-10 and divide every three to four years in the fall. 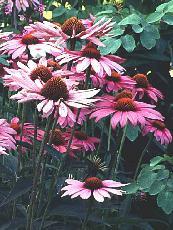 Light pink, feathery plumes appear late in June and early July; roughly 10 inches high and 12 inches wide. 1993: Veronica �Sunny Border Blue� or speedwell. Prefers full to partial sun with a rich, well-drained soil. Leathery looking dark green foliage is topped with deep blue spikes July through August. Awesome cut flower and vertical accent in the garden. Reaches 24 inches in height and spread; divide early spring every four years. 1992: Coreopsis verticillata �Moonbeam� or thread-leaf. Provide full sun and well-drained soil. Small lemon-yellow flowers top finely textured foliage. Blooms July through August and reaches a height and width of 20 inches. Divide in early spring when necessary. Prefers partial sun and a moist yet well-drained soil that�s rich in organic matter. Red-bronze, shiny foliage with clusters of tiny white, bell-shaped flowers topping 12 inch stalks in July; plant width reaches 15 inches. Divide in early spring when necessary. Remove flower stalks, but leave foliage intact for winter.